Disease. Gun Fight. Snake Bite. Bar Fight. These are just some of the ways Seth MacFarlene uses to execute in his newest film A MILLION WAYS TO DIE IN THE WEST. A Million Ways To Die In The West is a comedy that is directed by, written by, and stars Seth MacFarlene. Or, as every advertisement would like to remind us “THE GUY WHO BROUGHT US TED!” He also gets some help from his “Ted” writing partners Alec Sulkin and Wellessley Wild and some very famous costars, as some equally famous cameos by Ewan McGregor, Gilbert Gottfried, Christopher Lloyd, Dennis Haskins. 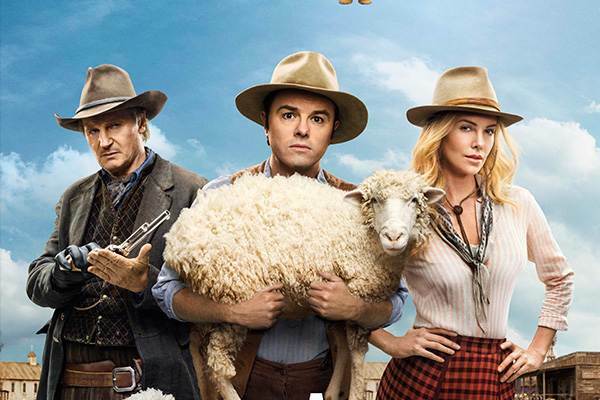 Besides the subplot of all the ways to die in the west the movie is about Seth’s character Albert, a terrible and courage-less sheep farmer, who loses his girlfriend Louise, played by Amanda Seyfried, by withdrawing from a gun fight and attempts to get her back by making her jealous with his new to town friend Anna (Charlize Theron). Of course he falls in love with this new girl and eventually discovers she’s married to the baddest man in the west which leads to trouble. One thing’s for sure Seth knows how to pull in the A-list talent and if you’ve ever seen Family Guy or Ted you know he loves a good random cameo as well. This movie is no exception with Liam Neeson playing Anna’s husband Clinch (the best shooter in the west), Giovanni Ribisi as Albert’s virgin best friend Edward, Sarah Silverman as Albert’s prostitute girlfriend Ruth, Neil Patrick Harris as Louise’s new rich beau Foy, and a slew of surprise cameos. It’s definitely an embarrassment of riches of talent for any director so the question is does Seth make the most of his riches or does he die trying? The answer is – kind of. Allow me to explain. There were a ton of extremely hilarious moments such as the musical number with Neil Patrick Harris’ character Foy, numerous interactions between Ruth and Edward, and of course each surprise cameo packed a great punch, Christopher Lloyds’ Emmett “Doc” Brown from “Back to the Future” movies included. On the other hand there were a ton of scenes that lasted too long or entire acts, which is the case with the final act of the movie. There were also a few deaths that just had zero funny in them. You can’t really drag out the ending to a movie when everyone knows how it will play out and we’re just kind of waiting to get there and hoping for laughs along the way. Every scene did serve a purpose but if that purpose doesn’t also make you laugh in a comedy then it’s null and void. With that said there were simply too many scenes where that was the case. There were some magical moments where everything clicked. One of the best examples is the annual county fair. Here we get a few hilarious and random deaths and our first interaction between Albert, his ex Louise, his new friend Anna, and Louise’s new boyfriend Foy. This scene shows everyone’s personality perfectly and also sets up the path for the rest of the film. We also get to hear Neal Patrick Harris say “challenge accepted” and get a very funny cameo from a 90’s TV principal. I will also say the cast did a splendid job and were perfect for the roles they were cast in. Seth even managed to pull off some emotional moments very well. Too bad the acting just couldn’t make this as great as TED (assuming you loved TED like I did) and it falls short too often. Not a complete loss but not a movie you’ll want to watch twice. I give it 3/5 likes! – A decent time killer if nothing else.